Xerxes himself, looking like he has emerged from a gold bath and resplendent in various piercings, is relegated to a few booming sentences. The blood and gore is off the scale; warriors are hacked and cleaved in glorious CGI detail. Part-vamp and part-warrior princess in leather, Green is stunning as Artemisia. The film itself looks fantastic, awash in a red-sepia tone that dominates everything. Although you will have seen many action films set during a point of time in history (this one’s set in 480 BC), there is plenty in here to keep your attention from start to finish. ‘300 – Rise of an Empire’ is a step up from its predecessor in terms of story-line, acting and fighting sequences. Although the first movie focused more on the battles, the gore and the blood, this movie instead focuses more on the story-telling, the events that lead up to the first movie and well, of course, there’s a fair amount of blood and gore as well. Bottom-line, the film exhibits a substantially better story-line, great performances from the cast, a slew of familiar faces from the first film and obviously excellent visuals. Those expecting those slow motions fights and intense battle scenes won’t be disappointed. In fact this time around we also get a lot of literature on the backstory and where these characters come from. If you suffered from a 300 hangover long enough to lust for another round of some exotic imagery and blood curling sword fights then Rise of the Empire is the prime ticket this weekend. This movie is also not for people looking for an original plot. 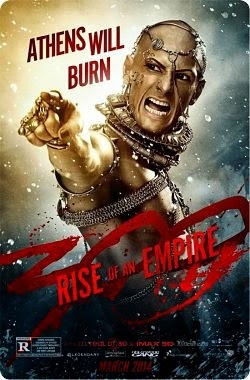 Much of 300: Rise of an Empire is a mere retelling of the events of 300. It’s also like its predecessor, in the fact that there’s almost no character development. In fact, the only character who’s actually fleshed out is the antagonist. 300: Rise of an Empire is visually-stunning and a must-watch for anyone who liked 2006′s 300. Though it’s not as good as its predecessor, it’s still an entertaining movie. Action movie fans, in particular, are bound to enjoy this flick. Is the action any good? Hell yes. The pitch sea battles are stunning, as is the thumping music that accompanies them. That way the film is never boring. It’s the exact same structure of the first film, and there’s even an Ocean version of the Hot Gates. The action sequences are certainly not as iconic as the ones in 300, barring one where in a huge uncut take Themistocles horse rides across three ships and battles Artemisia. It’s when you want to tell director Noam Murro dude just give us the action, not the lame and boring attempts at character development. The glistening abs are back in 300: Rise of an Empire, and they’ve been doing crunches. Like its forerunner, the 2007 hit 300, Rise of an Empire again plunges us into bloody, hyper-stylized Greek history: mythology with muscles. The computer-generated warfare franchise is now a third of the way to a six-pack. Made clearly to capitalize on the popularity of 300, Rise of an Empire is something like collected behind-the-scenes from the Persian invasion featured in 300.